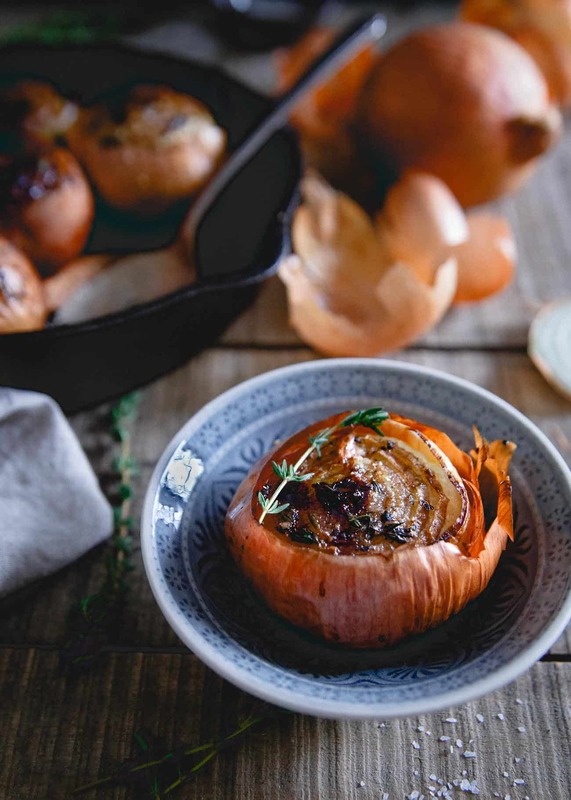 These whole roasted onions are seasoned with sweet balsamic vinegar and fresh thyme. The long roast time leaves them soft and buttery, almost melting in your mouth with each bite. I’m basically bi-polar when it comes to onions. There aren’t many other foods I find more disgusting than raw onions. Ugh, gag, gross. That raw onion taste just lingers for daysssss. That said, there aren’t many other foods I love more than sweet caramelized or roasted onions. I actually had to make an onion jam for a freelance project recently and have been putting it on all.the.things. ever since. 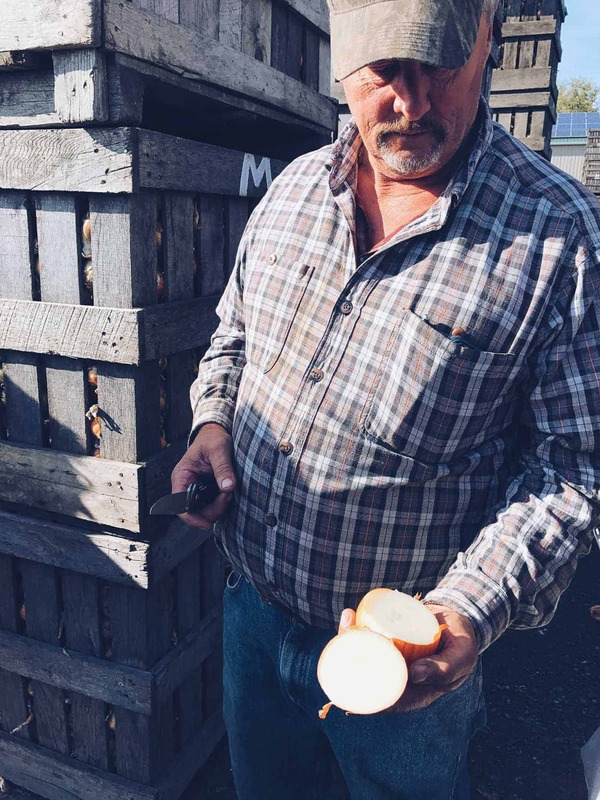 A few weeks ago, I got the opportunity to visit Minkus Farms, a local onion farm as part of the New York State Grown & Certified Program. Minkus Farms is one of the many New York produce farms joining in on this new program that will be launching in the spring of 2017. As someone hugely into buying local, in fact, I’d rather buy local than organic any day, I’m really excited about this new program. With a goal of educating people on the importance of buying local and strengthening confidence in products grown by New York state farmers, it’s something I’m excited to support 100%. To receive the certification, farms must be inspected for safe food handling and environmental stewardship, and their products must meet the highest quality standards. In addition, farms and farmers must currently be certified for Good Agricultural Practices (GAP) and participate in Agriculture Environmental Management. It’s a combination of modern food safety standards and environmental stewardship. The state is both helping consumers by giving an assurance of quality in how and where the food is grown and produced, while also promoting local producers who are meeting these safety and environmental guidelines. So now when you’re in the store you won’t have to wonder if the produce before you was flown in from 3,000 miles away or not AND you get a guarantee of quality practices both from a safety and environmental standpoint. Besides learning all there is to know about onions (best tip of the day: mushy, soft “tops” means the onion is likely rotten in the center, pick the dried out ones instead!) 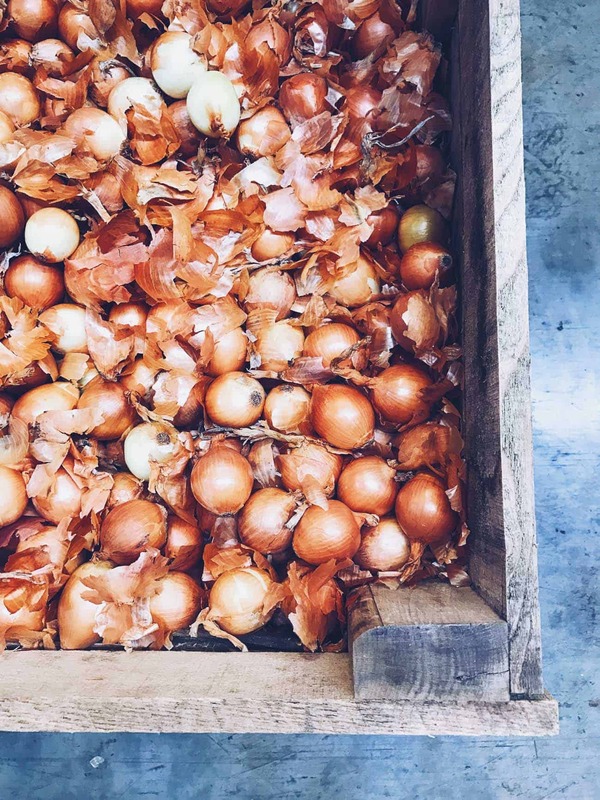 and standing in an onion warehouse that resembled the ball pit at gymnastics (or McDonalds play place) just on a 1000x larger scale, we were all sent home with a 10 pound bag of onions to play with. It was actually hard for me to come up with an idea of what to make with onions that really showcased the onion! So often, they’re just one of the building blocks of a recipe, not the starring role. Unless we’re talking about these Mexican stuffed onions – those are a dinner favorite! Well, these whole roasted onions change that. While I kept the onions whole and roasted them with the skin on, you can definitely roast onions without the skin and cut them in half or quarters too. 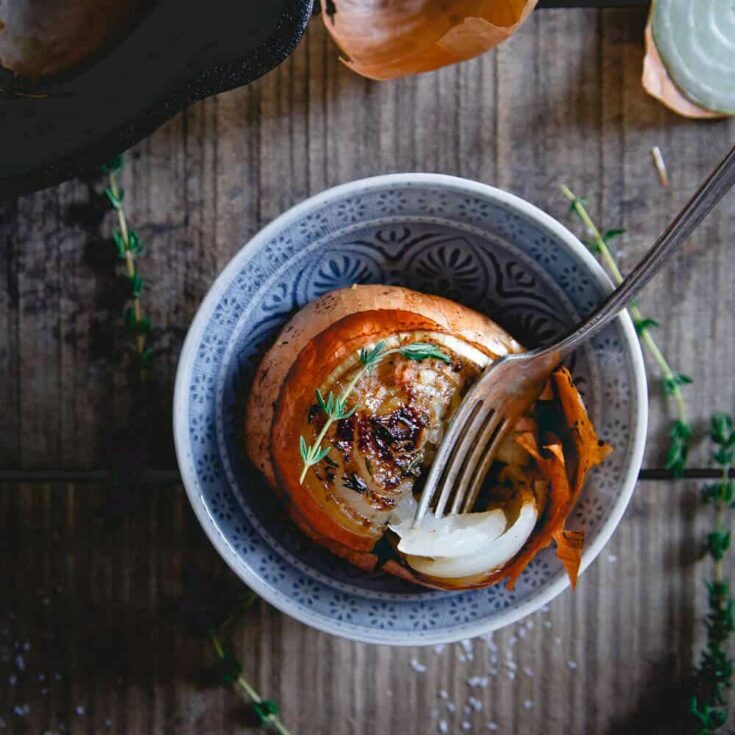 If you make the roasted onions that way you can still use the same seasoning blend this recipe calls for. Roasting the onions at 400°F (although I’ve gone up to 425°F before too with success) for about an hour in the oven if they’re whole (a little less if you cut them in half and even less if quartering them) will give you a perfectly roasted onion. Seasoned with just a bit of fresh thyme and balsamic vinegar, the result is a buttery, caramelized, slightly sweet side dish that’s just begging to be served with a nice hunk of meat like this rosemary garlic flank steak or these sticky honey soy pork chops. The onions practically melt in your mouth with each bite and it’s almost crazy to me that these whole roasted onions are the same vegetable as those disgusting raw translucent slices so many of you put on your sandwiches! Try this Caramelized Peach and Onion Salsa or these Skillet Lamb Chops and Cipollini Onions – both featuring deliciously roasted onions as the star ingredient! Slice off the tops of the onions and a small sliver on the bottom so that they sit flat. Leave the skin on around the outside and place in a small 8 inch cast iron skillet. Drizzle the onions with the olive oil then season with the salt, pepper, balsamic vinegar and thyme. Break the butter up into small pats and place on top of each onion. Roast for 45 minutes to 1 hour until golden brown and soft. Very interesting post today Gina! This is one of my favorite ways to enjoy onions. Perfect with a nice juicy steak! Can’t wait to give your recipe a try! That is too funny, I am the exact same way with onions! 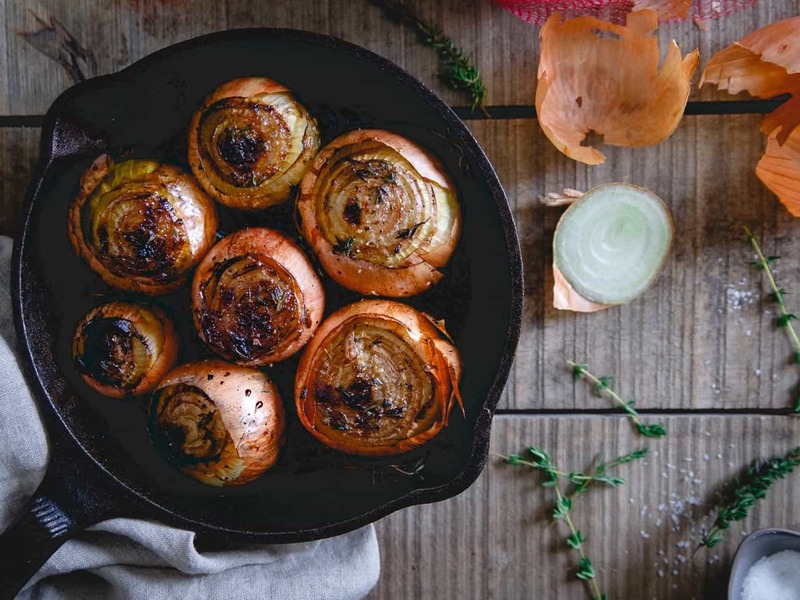 These roasted onions sound great though! I’m right there with you on raw onion. I can’t stand that I burp them for hours and the way the smells sticks to my hands immediately. I gag when my husband loads up his sub sandwich with them! However, roasted is a whole different story. I love how sweet and mellow the flavor becomes and the balsamic and thyme on these is perfect! omg, onion burp is THE worst. My husband is the same way, I cringe when he orders sandwiches with onions. Oh my gosh, these look SO good! 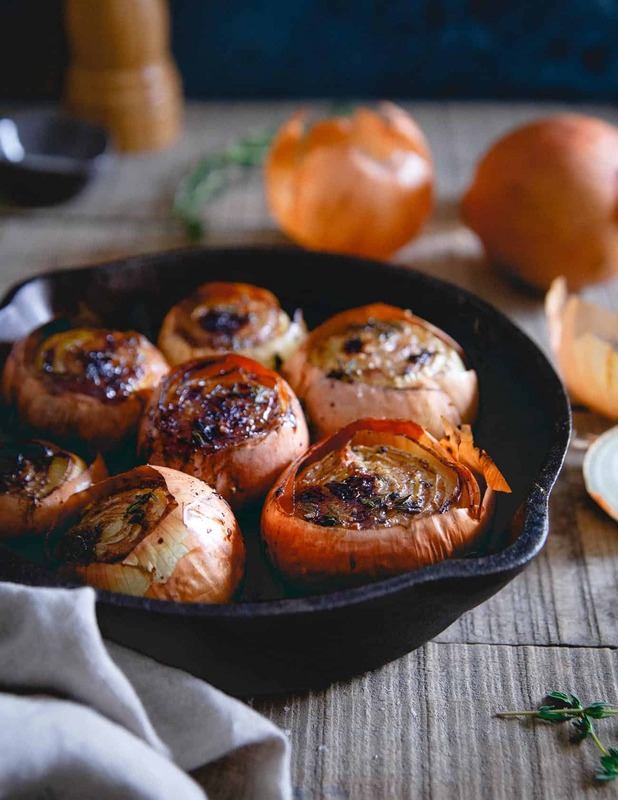 nothing beats roasted onions and these look like perfection! These look delicious. 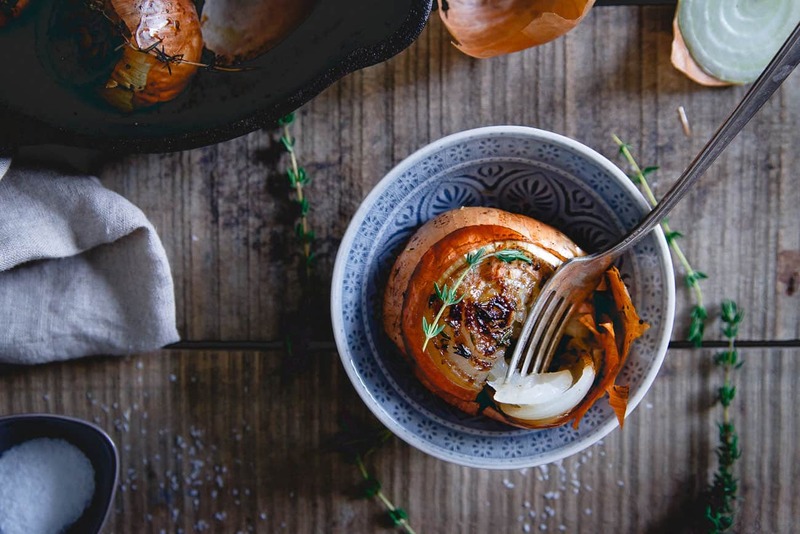 I love roasted onions but have never roasted them whole like this! My house would smell ahhhhh-mazing after baking these. Very cool post! I, too, will take local over organic any day. I would have a field day with those onions! Personally, I love them raw, but only in the right applications (and usually not yellow onions). These look delicious and so easy, too! But what I’m really intrigued by now are those Mexican stuffed onions. Hellooo! I like onions in all forms (although I sometimes soak raw onion slices in warm water first to draw out some of their pungency). Such a cool idea to roast them whole! I can. not. wait. to try this! I’m the same with onions. Raw – hell no! Saute, roasted, caramelized – all day long! I could seriously make a meal out of these roasted onions. I’m a HUGE onion fan, and this recipe looks like something I would love. These could easily be a meal for me, or served along side a soup. I’m definitely make them as soon as possible! And very interesting about the certification program. I’m assuming my onions are being sourced from some place on the west coast, but I don’t honestly know. Time for me to find out! Absolutely LOVE this post. One because onions rock. Two, because this recipe, yo. Three, love the images from the farm. 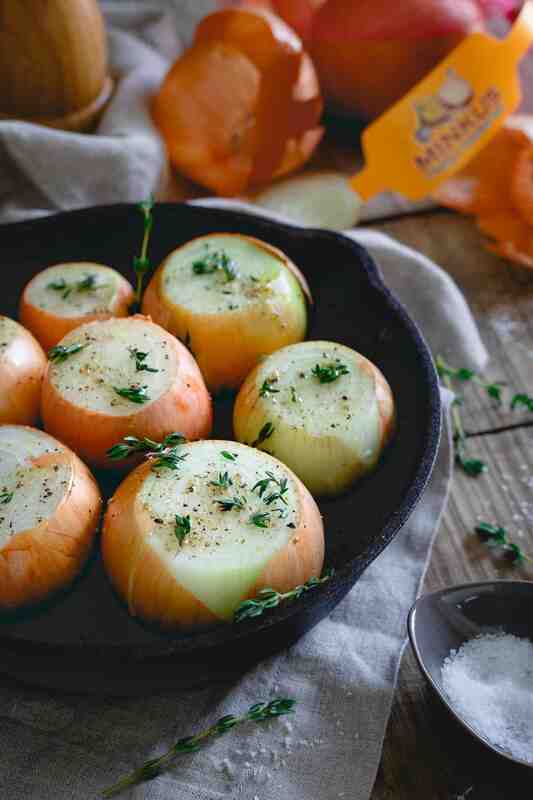 These roasted onions are such an awesome tasty side! The recipe lists 2 tablespoons of extra virgin olive oil as an ingredient, but the directions don’t mention the oil at all or say what to do with it! ??? Sorry about that, looks like I accidentally left that out! The recipe has been edited to include when/how to use the olive oil. Hi there! Just wondering how long these bad boys will last refrigerated once cooked? Thinking of meal prepping with them for a few dinners in the upcoming days. They’d probably be good for about a week in the fridge. I’m an onion lover so I don’t need an excuse for any onion recipe but I did this and they are amazing absolutely amazing..